The iPad is a great device - sitting on the sofa, on the train or just where ever, the iPad (Mini in my case) is a fantastic tool. I can happily write a blog post, browse the Internet or generally do pretty much anything I can do on the Mac on the go using the iPad. One exception has been to plan my biking or running routes. 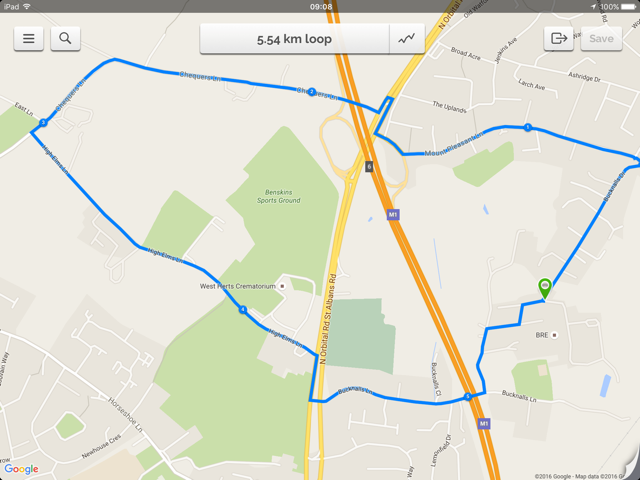 For this, I’ve used Ride with GPS on the Mac to create my routes. This has easily let me create a route to follow as the planning route snaps to roads and tracks of the area I’m looking at travelling in. However, this doesn’t work to well on the iPad as RwGPS relies on being able to browse the map and using left click to drop a pin for the route. This means that trying to plan the route on the iPad means that you start dropping pins all over the place whilst you try and browse around the map! Not ideal and makes life extremely difficult. However, this all seems to have changed when I discovered Footpath. 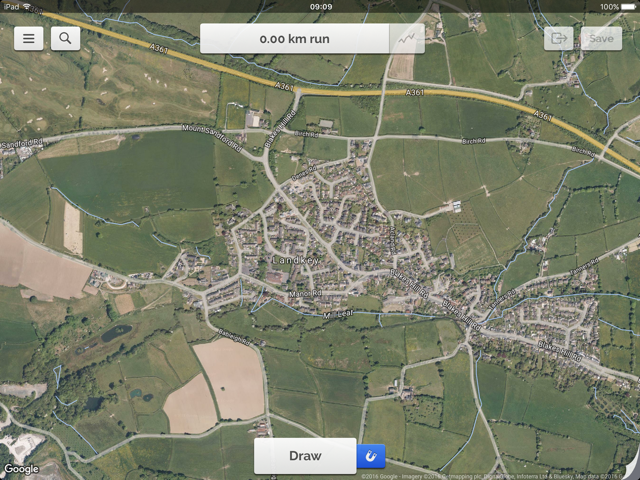 Footpath is an app that allows you to easily create running and cycling routes on an iPad by tracing the route. The created route gives you the distance that you’ll travel and can also give you the information on the elevation of the route, allowing you to see how hilly it is. 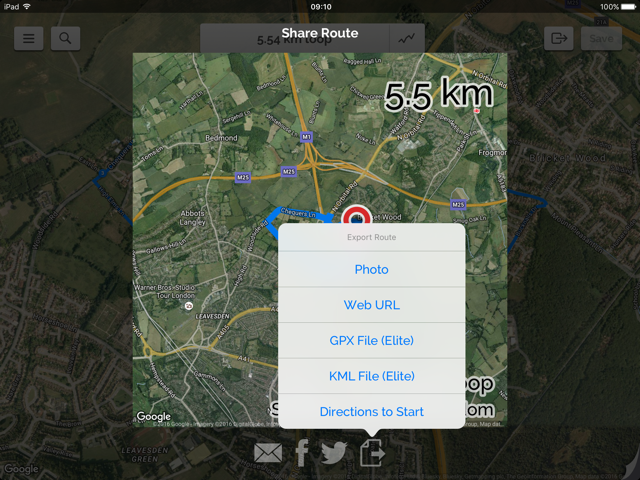 Once complete, you can save the route and export it to your computer for use with a GPS device, though it can also sync via iCloud to Footpath on your iPhone. To draw a map in Footpath, you move around using touch, like any other map on the iPad. When you want you draw the route you want to run, you press the draw button at the bottom and the map stays in place. You then draw on the screen along the route you want to take (it doesn’t have to be accurately on the route) and the app will create the first section of the run on the route and drops you back into browsing mode. You can then find the next bit of the run you want to do on the map and then press the button to draw from where you left off. If that sounds complicated, it’s far easier than it sounds as it’s fairly intuitive. In general, the routing algorithm is pretty good - you don’t have to follow the roads exactly for it to plan the route as it snaps to roads and paths and you also don’t have to start each section of route from the point that the first one ended - it’ll link each “swipe” together into a route. You can have a range of maps in the background to act as the route planner and you can set up whether you want Footpath to plan the route for running, cycling or driving. I’ve not used the driving part, but I assume this means that the snap to route only sticks to roads. I’ve only changed it whilst planning, purely so the section at the top of the screen reflected what I was actually planning and I’ve haven’t seen much difference in the routing mechanism. Perhaps this is because I haven’t tried to plan any routes yet that involve footpaths or cycle ways yet. 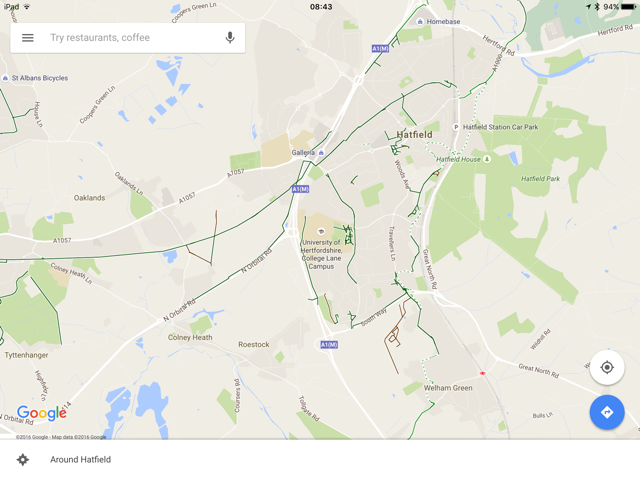 One downside is that the Google Maps view cannot display the cycle paths option. 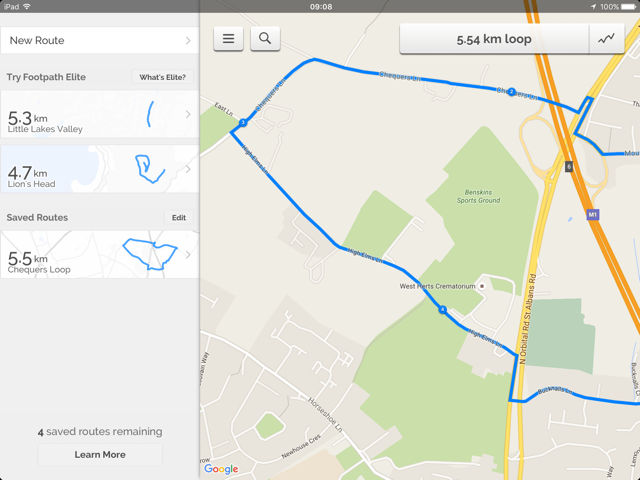 For example, on the iPad app (and website), Google Maps can display cycles paths as shown below. This could help in plotting a route but the Footpath app doesn’t display this and it cant be enabled. It means that if you want to use cycle paths and footpaths, you’re probably best off upgrading to use the Open Street Maps versions as these include these routes as default. Part of the reason for creating a route would be so that you can ride or run the route. In it’s basic form, Footpath allows only the export as a photo or as a web URL - neither of which are very handy for importing into a GPS device if you want to follow the route at a later date (though, it would be fine if you’re just trying to map out different routes and different distances in an area around your house). At this point, you might want to upgrade to the full package with the in app purchase as this then allows the export of the routes as a GPX file. I was able to import this GPX file into both Strava (using the Strava labs GPX importer) and Ride With GPS to allow me to run or ride it at a later date. Footpath can be initially downloaded for £0.79, though this is pretty much a demo option as it has a number of restrictions, though the £0.79 app does provide a pretty good indication of the app before you pay the £3.99 to upgrade to the full option. The app places restrictions by limiting you to a small number of maps as the background (Google Maps), it restricts you to only saving five routes, you can’t edit the route once created without creating the route again and lastly, the big issue for me, is that you can’t export the route as a GPX or KML file (which is what you would need for using on a GPS device) without upgrading. However, after some playing with the app, I happily paid the in app upgrade fee as the app allows me to easily create a route (in fact, it’s potentially easier than using RwGPS). 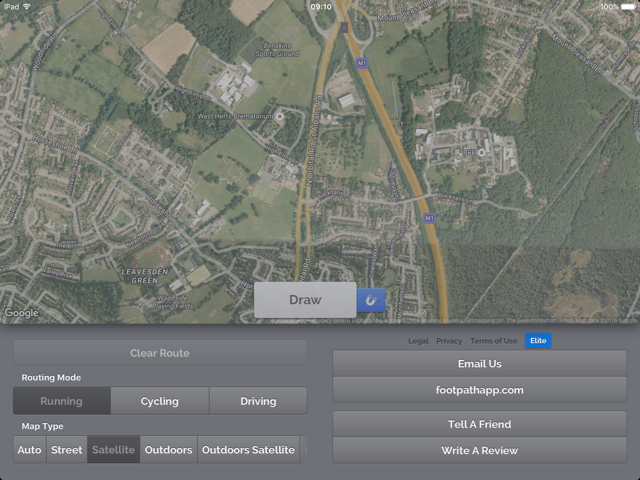 Upgrading gives you a greater number of options in terms of mapping, so if road cycling isn’t your thing, you can use the Open Street Maps which gives a much better routing set that doesn’t involve roads. Footpath allows for easy creation of routes using a map - be that for walking, running, cycling or driving. These can then be exported for use in other devices or software, allowing you to use your iPad for planning these routes. It’s simple and easy to use and with the in app purchase, a fully rounded app. It’s better than using any of the current web interfaces (on your iPad) for sites such as Ride With GPS that allow you to create a route to ride, but as you can export the ride, you can later upload it to a website like this and make some final adjustments or share it with friends. One thing I would like to see is GPX import so that I can make some changes to a route that has already been created. This would need to be a “pro” feature as well I think for the developer to consider it. It might also be nice to change the start and finish point on a route, though I can see how this could be a challenge considering the drag and drop style of creating the route. In my mind, the £4.78 the app costs for the in app and initial purchase is totally worth it. It lets me quickly plan out routes for whatever activity I want to do and get an estimate of the distance (and therefore time as well).